Most AirPlay speakers have failed at their central purpose. Life is not made easier. Your liberation from wires comes with a monstrous configuration headache. But not with Pioneer's portable XW-SMA3. It finally delivers high-quality wireless audio in an easy, awesome package. You heard right! A $400, semi-portable wireless speaker that can connect via AirPlay, DLNA, or HTC Connect—HTC's AirPlay equivalent for One-series phones. Sonic fiends who want wireless, great-sounding music at home (and occasionally to go). Handsome as black plastic speaker boxes come. You can connect the speaker wirelessly using six different procedures. which each require a little button pushing and manual reading. Once connected you control the speaker either from the external device or from the included remote. An awesome sounding speaker with a big battery. Capacitive buttons don't belong on stereo equipment. Touchscreens, yes. But on speakers, people like buttons and knobs and dials. Merely a quibble. Despite the confusing, poster-sized "Quick Start Guide," the speaker is actually very easy to configure. There are just SO MANY OPTIONS. Comfortable handle on the back of the box. box's shelf on the back that makes the speaker easy to carry around. The iOS compatible USB port, Ethernet port, DC in, and AUX in are sealed behind rubber flaps that are tricky to pop out. Despite the external antenna, this AirPlay speaker doesn't connect to your wireless any better or faster than gadgets that don't have antennas. Since there are so many different configuration options, this speaker is a tad more complicated than many of the others out there, like our previous favorite the Audessy Audio Dock Air. Connecting to the device is actually very easy once the speaker remembers your Wi-Fi network. You never need to set it up again. To set it up, pull Wi-Fi settings off your iPhone using a 30-pin USB cable or off your router using an ethernet cable. Or access a web-based configuration interface from your phone or computer. If you're not near Wi-Fi you can turn the speaker into an ad-hoc hotspot and connect to it using any DLNA compliant device. The speaker sounds awesome. Great detail, and powerful, convincing bass. It's also really loud. Maybe not 100 people loud, but plenty loud. The battery is rated to last up to 5 hours. It ran for a bit longer than that, playing at very low volume. We will update with a test of battery life at party volume as soon as we can take it to a party. 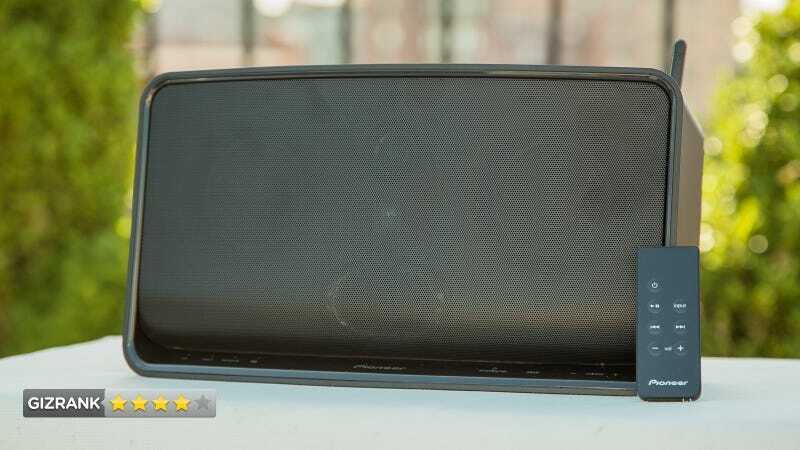 Thanks to strong battery power, that handy handle, and its rain-proof build, the speaker is supposed to travel well. It definitely can, with some caveats. The thing fit easily into a backpack, but it weighs almost eight pounds. You're going to think long and hard before you carry it around with you for hours and hours. Also, the speaker's cosmetics won't hold up to lots of too-and-fro travel. Yes. Between the Pioneer XW-SMA3's battery power, and the breadth of relatively easy configuration options make this the best cordless AirPlay speaker we've heard yet. The objections are pretty minor. On the price, well, I wish it was cheaper, but that's what these things cost!